You can use the Microsoft Task Scheduler to view and manage your scheduled publications. To access Ivanti Patch for SCCM scheduled tasks, select Start > Administrator Tools > Task Scheduler > Task Scheduler Library >Ivanti Patch for SCCM. 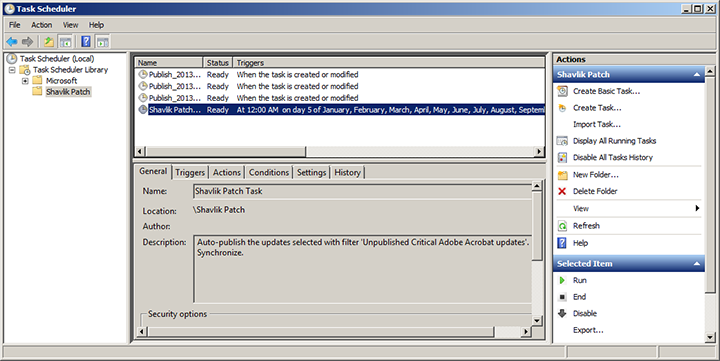 •One-time tasks can be run, deleted, disabled, or rescheduled using the Microsoft Task Scheduler. •After a one-time publishing task completes, the task will continue to be displayed in the Microsoft Task Scheduler for one to two days. •If you alter a recurring auto-publish schedule using the Ivanti Patch for SCCM Settings dialog, the task will be automatically rescheduled. •If you clear the Schedule download and /or publication check box in the Settings dialog and click OK, the recurring task will be deleted from the Microsoft Task Scheduler.